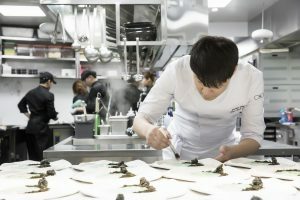 “I try to interpret traditional Korean cuisine with flavors and techniques that are easier for the younger generation gourmets to understand and fall in love with,” says Chef Choi. Gastronomes are invited to savor Chef Choi’s creative culinary arts through set dinner menus of 6 courses as well as an à la carte menu of his signature dishes. 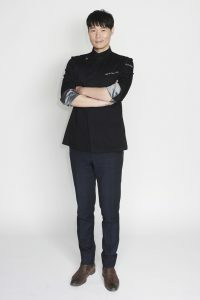 Chef Choi has gained stardom and strong fan following across the globe thanks to his regular appearances on the viral TV show Please Take Care of My Refrigerator. The cooking variety show premiered in 2014. Competing chefs need to cook a dish using ingredients from celebrity guests’ refrigerators in a mere 15 minutes. The show cast A-list South Korean acts including Big Bang and Twice. Celebrity chef Gordon Ramsay also made a guest appearance in the show. 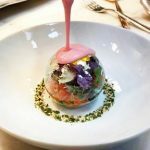 Apart from the set menus and the à la carte menu, gourmets will also be able to sample Chef Choi’s dishes at Ozone’s Dom Pérignon Ultimate Brunch on October 21st. All prices are subject to 10% service charge. For reservations, please contact Restaurant Reservations at (852) 2263 2270 or via email at restaurantreservation.hk@ritzcarlton.com.